I just wanted to start by making everyone aware of an article that was in the Denver Post last weekend about the results of Colorado's Turnaround Improvement Grant efforts after 1 year. You can access the article at this link. The story insinuates that investing Turnaround Grant dollars in a partner company, like we are doing in Center with Lindamood-Bell and Focal Point, is a waste of money. I have attached a chart that was included in the article that shows results of Colorado school and district Turnaround Grant efforts after 1 year of CSAP results (Spring 2011). I would like to note that our very own Haskin Elementary School here in Center had the greatest increase in its performance framework score of all the Turnaround schools in the state of Colorado after 1 year of improvement efforts. I would also like to note that the Center School District had the greatest increase in its district performance framework score of all districts in the state that have Turnaround schools, improving by 9.9 points (on a 100 point scale) compared to the next closest district, Denver Public Schools, with a 1.9 point increase. This additional increase is the result of the great work being done at Skoglund Middle School and Center High School. Much of what is being done in these buildings is a result of Center’s partnerships with Lindamood-Bell and Focal Point. Nobody from the Denver Post called us to ask if we think our money has been wasted on our partners. Upon reading this article Marcia Neal, our State Board of Education representative, noticed our positive results and called me to ask about how we got such significant growth. I told her the difference in Center has been our willingness to take what we have been taught by our partners and to do the hard work that is necessary to make it successful. Our wonderful first year progress is the direct result of teachers working hard and taking to heart our new curriculum and instructional practices. Our first year progress is also the result of our building administrators working hard, changing the way they do their jobs, and focusing on offering feedback and support to teachers to help them do their job better. In addition, our year 1 progress is the result of our classified staff working hard, applying the new skills they have learned, and filling the voids left by teachers and principals whose roles have shifted tremendously. I also believe our wonderful first year progress is the result of a Board of Education that has helped us to choose a good direction and stay on course to do all this hard work we are engaging in. This Denver Post story attempts to prove that dollars don't make the difference when it comes to school improvement. Had we never received the Turnaround Grant we have been blessed with we would likely never have learned the new skills we have gleaned from our partners. These dollars are making all the difference in the world to our kids in Center! OUR success has come from both the outside and from within. After discussing this matter with Center School Board President Michael Lobato he said, “The point we need to get out is that EFFECTIVELY putting more resources to use WILL improve student achievement". Shifting gears, I would like to thank Center Schools Director of Technology Julio Paez for his continued efforts to keep our students from finding ways to circumnavigate our web filtering system on campus. I view Julio’s “goalkeeping” work as a good problem to have. It is the result of our ability to provide students in grades 4-12 with a personal laptop computer to use as an instructional resource. 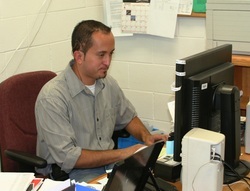 This past week Mr. Paez discovered that some of our students had devised a new way to get around our web filter. Upon realizing this, Julio re-secured our system and the students who were involved have received a consequence appropriate to their actions. Finally, a big thanks goes out to the Haskin Elementary School Sunshine Club for their continued efforts to improve the work climate in the building. Weekly treats continue to be on tap for staff members, special events are celebrated, and another after school team building gathering was held this past Friday. Lots of people have been involved in making these efforts a success, but I would like to thank Third Grade Teacher Christine Mikeljack for providing the inspiration that started this process. We had no school on Monday in celebration of President’s Day but the annual Center Kiwanis Pancake Dinner took place (for the last time in our current cafeteria) and our Americorps workers held a successful Community Recycling Day. Tuesday was spent finalizing a 21st Century Community Learning Centers Grant that would fund more adult education opportunities for Center community members, as well as offering additional after school reading support for our children in need of such services. I want to thank Academic Recovery Center of the San Luis Valley Director Joy Werner for the great work she did putting the grant together. On Wednesday I attended our weekly construction core committee meeting then made a quick jaunt to Denver and back to present information on the Lobato v Colorado lawsuit to a University of Northern Colorado graduate Education Leadership class. On Thursday the combined Center-Monte Vista Administrator Professional Learning Community meeting focused on how to offer more support for teachers in engaging all students in classroom lessons. In addition, Colorado Department of Education Associate Commissioner Keith Owen visited the district that afternoon to see how we are doing on our Turnaround process as well as to view our new school construction project. 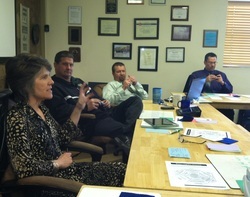 On Friday I was off to Durango to attend the Colorado Department of Education Rural Education Council meeting. This council that I serve on meets on a quarterly basis to seek ways to share resources and offer support for rural school districts all around Colorado. It is now likely that all 14 school districts in the San Luis Valley will be pooling their Race to the Top Round 3 dollars in an effort to secure a common curriculum aligned to current state standards and to support teachers, building administrators and superintendents in guaranteeing effective delivery of this curriculum to their students. We are currently focusing on creating a scope of work for this Valley Collaborative that will be acceptable to the Colorado Department of Education. Another major task we are undertaking is to prepare for our upcoming arbitration session with Saguache County regarding how to distribute this year’s Secure Rural Schools fund dollars. At this week’s construction meeting I learned our heating system has now secured enough points to allow us to achieve LEED Gold status. We also discussed possibly including two Magic Planet displays in the school that would allow the library and science departments to show graphic visuals of processes such as plate tectonics, the changing of seasons, weather patterns and even landscapes and atmospheric motions on the various planets in our solar system. Other items we addressed included clearing out the gym in preparation for demolition. As of now our old bleachers are destined to be repurposed at the Creede Schools gymnasium. It is very possible the gym will come down by the end of this week. This means we believe that not only administrators and teachers must put forth their best effort and work to improve their skills, but so must paraprofessionals, office staff, custodians, transportation workers, cafeteria staff, and technology staff. The ultimate purpose of this pursuit of excellence is to infuse it in our children. It is our belief as a district that by expecting more of ourselves and of others we will help our children to achieve the excellence that lies within them. I will be traveling to Denver and back on Monday to attend the monthly Colorado Education Association, Colorado Association of School Boards and Colorado Association of School Administrators Anchor Group meeting. I'll be returning in time to attend the Sargent Schools Board of Education meeting that evening to discuss with them the San Luis Valley Valley Race to the Top Collaborative we are all working on. On Tuesday I will be meeting with Haskin Building Leadership Team members about their recent visit to various schools that are incorporating the Capturing Kids Hearts process. Also on this day, we'll be having a formal Colorado Department of Education Turnaround Improvement Grant site visit. On Tuesday evening we'll be holding a going away party for our latest Americorps crew. Finally, on Tuesday night we will hold a special Board of Education meeting to accept our audit and to conduct a work session on how we will implement the Senate Bill 191 Teacher and Administrator Effectiveness law. On Wednesday I’ll be working with other Valley Superintendents on establishing the scope of work we’ll be conducting through our Race to the Top Round 3 collaborative. On Thursday I’ll be meeting with Adams State College personnel to support the writing of a Colorado Department of Education Teacher Quality Grant. During the middle of the day I’ll also be attending an El Pomar Grant Awards Banquet in Alamosa to accept grants for our library, adult education program and pee-wee sports program. I will be taking Friday off as a personal day to spend time with my family. I can’t agree more. Center Schools has been acquiring and developing such capable people and they are significantly improving the learning outcomes of our children. Thanks for listening again and have another great week.